The All Progressives Congress is consulting its lawyers in its legal department to file a reaction on the eligibility of its candidates to run in Zamfara state in the 2019 election. INEC said in a letter today that the party is not eligible to field candidates for governorship, national assembly and state assembly positions in Zamfara State. How did APC miss their chance to have candidates? The letter signed by Okechukwu Ndeche, the commission`s acting Secretary read: “Failure to Conduct Primaries in Zamfara State Within the Stipulated Time-frame." "Please refer to the timetable and schedule of activities for the 2019 general elections released by the commission on Jan. 9 2018. “Consequently, based on the provision of Section 87 and 31 of the Electoral Act 2010 as amended, the commission does not expect that your party (APC) will submit names of any candidate from Zamfara state. However, NAN learnt from an authoritative source in the APC National Secretariat that the party leadership would contact its legal department before responding on the matter. 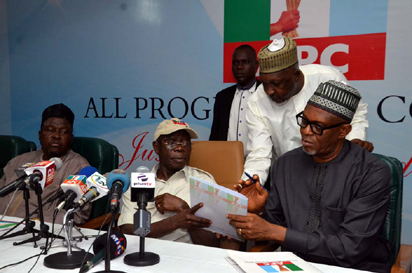 The APC National Working Committee (NWC) had on Oct. 5, dissolved the party executives at all levels in Zamfara, after contentious primaries said to have been conducted on Wednesday 3 October. Mr Yekini Nabena, the APC acting National Publicity had said that by the decision, all supposed party factions in Zamfara were dissolved. The dissolved party executives had claimed they conducted primaries on 3rd October which picked a Yari anointed candidate, Alhaji Mukhtar Shehu Idris as winner of the governorship primary election, and Yari himself as winner of Zamfara West senatorial ticket, in a primary conducted 4 October. The NWC invalidated the results. Now APC has lost the state completely.